Netflix has announced the official launch of the streaming service in Germany, including support for the Apple TV that is lacking in other nations. The company said: "Guten Morgen! 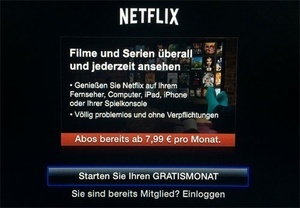 Netflix ist in Deutschland. Und ganz bald auch in Österreich und der Schweiz netflix.de." Roughly translated, the message was "Good Morning! Netflix is in Germany. And very soon in Austria and Switzerland netflix.de." Netflix recently expanded to France and will continue its expansion very soon to Switzerland, Austria, Belgium and Luxembourg. The international expansion has been top priority for the company as it greatly expands its catalog of original programming and exclusive programming. The service will start at 7.99 euros per month and include German content, and Netflix's own original content and other movies and shows. "We are proud to bring the future of television to Germany," added Netflix CEO and co-founder Reed Hastings. "German consumers now have instant access to a great selection of shows and movies, anytime and anywhere."